Lieutenant General Tim Keating, Lieutenant General Jerry Mateparae, Major General Peter Kelly. The New Zealand Special Air Service, abbreviated as the NZSAS, was formed on 7 July 1955 and is the special forces unit of the New Zealand Army, closely modelled on the British Special Air Service (SAS). It traces its origins to the Second World War and the famous Long Range Desert Group that New Zealanders served with. The New Zealand Government states that NZSAS is the "premier combat unit of the New Zealand Defence Force" and it has been operationally deployed to locations including the Pacific region, Afghanistan and the jungles of South-East Asia. Individual members of the NZSAS have received honours and awards, most notably the Victoria Cross for New Zealand awarded to Corporal Willie Apiata. In 2004, the unit was awarded the United States Presidential Unit Citation for its contribution in Afghanistan. The NZSAS was accorded regimental status in 2013. It has the responsibility of conducting counter-terrorism and overseas special operations, and performing the disposal of chemical, biological, radiological, nuclear and explosive hazards for military and civilian authorities. The NZSAS can trace its roots back to the famous Long Range Desert Group, a British/Commonwealth army unit which fought in the North African desert in World War II. New Zealanders also served in the original Special Air Service force during World War II. In February 1955 it was decided by the New Zealand Government that a squadron based on the British Special Air Service should be formed as part of the New Zealand Army, as an effective and economic contribution to the Far East Strategic Reserve and the British counter-insurgency effort in Malaya. Major Frank Rennie was appointed to form and command the unit, with the decision having been made to recruit mainly from the general public around a cadre of Regular Force personnel. Over 800 applied, from which 182 including 138 civilians (though 101 had previous military experience) were selected for training beginning in June 1955. In late 1957, soon after the squadron's return to New Zealand from Malaya the unit was disbanded, having been operationally replaced by an infantry battalion. The NZSAS was re-established in October 1959, with the unit celebrating its 50th Jubilee from 3–12 June 2005. The NZSAS were granted the Freedom of the Borough of Thames on 27 September 1967. As part of changes the NZDF's command structure, the 1st New Zealand Special Air Service Regiment was transferred to the command of the new Special Operations Command on 1 July 2015. When the unit was first established in 1955, prior to the departure to Malaya all training was conducted at Waiouru Military Camp. Upon re-establishment of the Squadron in October 1959, it was based at Papakura Military Camp, until the unit was relocated to Hobsonville Air Force Base in the mid-1990s, however the NZSAS Counter-Terrorism and demolitions training facilities remained at Papakura and Ardmore Military Camps. In 2001–2002 a new facility for the unit was built at Papakura Military Camp. The facility was named 'Rennie Lines', after the founding NZSAS Commanding Officer Major Frank Rennie and officially opened on 14 December 2002. The Battle Training Facility (BTF) was officially opened on 8 April 2016 in the Ardmore Military Training Area for counter-terrorist training to replace facilities over 30 years old. On 1 May 1955, after the Cabinet had given its approval the 'New Zealand Special Air Service Squadron' was formally established. From 24 August 1963 the unit was renamed to '1 Ranger Squadron New Zealand Special Air Service', in recognition of the 'Forest Rangers' who fought in the New Zealand Wars being one of New Zealand's first Special Forces units. The unit reverted to '1st New Zealand Special Air Service Squadron' on 1 April 1978. From 1 January 1985 the unit was known as '1st New Zealand Special Air Services Group' until its re-designation as a Regiment before February 2013. When the unit was established in 1955, approval was given for members to wear a maroon beret. The maroon beret was chosen as it was the then colour of the British Special Air Service beret. However, the British changed their beret colour to ecru (sandy-coloured) in late 1957, the same colour as had been worn by the SAS during the early stages of World War II. On 19 December 1985, approval was granted by the (then) New Zealand chief of general staff, Major General John Mace, who had previously deployed to Malaya with the original NZSAS Squadron, for the NZSAS to switch from maroon to the sandy-coloured beret worn by other Commonwealth Special Air Service units. A parade was held on 21 March 1986 to formally hand the new beret over to the unit. To show the close association between the NZSAS and the British Special Air Service members of NZSAS are authorised to wear black rank on all orders of dress except mess dress and to wear black web belts whenever web belts are ordered to be worn. On 20 November 1955 the NZSAS Squadron departed from New Zealand and after completing parachute training in Changi, Singapore, a 133-strong NZSAS Squadron was attached to the British SAS in Malaya. After undertaking jungle training in the rugged mountains of Perak, the Squadron went on to spend approximately 18 of the 24 months it was in Malaya operating in the jungle against communist insurgents. SAS operations in Malaya consisted of going deep into the jungle, locating local people and moving them for their protection, then seeking out terrorists in the area and 'destroying' them. From 2 April 1956 when the New Zealand Squadron became operational it was deployed to the Fort Brooke area, bordering the states of Perak and Kelantan. From late 1956 the Squadron operated in the 'mountainous' area of Negri Sembilan, between the towns of Seremban, Kuala Pilah, and Tampin. In both locations the squadron was involved in successful operations eliminating the local Malayan Races Liberation Army groups. During the two-year tour New Zealand patrols were involved in 14 separate engagements with the enemy, killing fifteen, capturing one and taking the surrender of nine others. The Squadron suffered two fatalities. On 2 May 1956 while patrolling, Trooper A.R. Thomas was fatally wounded, and on 11 May 1957 Corporal A.G. Buchanan died of heat stroke while on patrol. The Squadron returned home in December 1957. At the request of the Royal Thai Government a detachment of 30 men were stationed in Thailand from 2 June to 16 September 1962 during the Laotian crisis. The detachment was split into two Troops, with one working with United States Special Forces and the Marines at Udon in the north-east and the other deployed with a reinforced United States Army battle group at Khao in the central region. Neither Troop took part in any operations involving action against the enemy, but the deployment provided the detachment with an opportunity to train in jungle and mounted operations while working with American and Thai forces. In late 1964, during the Indonesian Confrontation (Konfrontasi) in West Malaysia, the New Zealand Government authorised the deployment of a New Zealand Special Air Service detachment to assist with countering Indonesian Communist insurgents in Borneo. The unit was deployed alongside its British and Australian Special Air Service counterparts. The Detachments served under the operational command of the 22nd Special Air Service Regiment and were employed on reconnaissance tasks and ambushing operations including CLARET operations. These involved crossing the border into Indonesia to gain intelligence information, and later, to deter the Indonesians from infiltrating across the border into Borneo. In February 1965, the first detachment of 40 men under the command of Major W.J.D. (Bill) Meldrum, known as 1 Detachment, 1st Ranger Squadron, New Zealand Special Air Service, departed for Malaysia. However, as a result of a perceived operational security breach Meldrum was replaced by Major Brian Worsnop from 3 April 1965. After a period of training with 22 SAS, 1 Detachment inserted its initial patrols on 8 April 1965. 1 Detachment carried out patrols, stopping for a training break from June to July 1965, until it was replaced by 2 Detachment on 11 October 1965. 2 Detachment was commanded by Major Rod Dearing and again composed of 40 men. It performed similar tasks to 1 Detachment; 2 Detachment's later patrols were conducted in the Sabah area which was "particularly rugged, steep and rocky". The detachment was withdrawn from operations on 10 February 1966, and was replaced by 3 Detachment which was commanded by Major David Ogilvy, who had previously deployed to Malaya with the original NZSAS Squadron. 3 Detachment conducted patrols from February, with the Detachment's last patrol conducted over the period 16 to 28 May 1966, which was also the last CLARET patrol conducted by the NZSAS. 4 Detachment arrived in Borneo in June 1966 under the command of Major David Moloney, just after CLARET operations had been stopped. As a result, this Detachment was utilised to continue a 'hearts-and-minds' campaign to gain support of local Punan tribes living near the border. On 12 August 1966 a formal peace treaty was signed by Indonesia and Malaysia and with the Confrontation finally at an end, 4 Detachment officially became non-operational on 9 September 1966. However the Detachment remained in Borneo until October 1966 before it returned to New Zealand. On 16 November 1968, a Troop from 1 Ranger Squadron, NZSAS known as 4 Troop, New Zealand Special Air Service, was deployed to the Republic of South Vietnam. The Troop consisting of one officer and 25 other ranks was based in Nui Dat, South Vietnam and served in the 1st Australian Task Force, attached to the Australian Special Air Service Regiment (SASR). The troopers were primarily employed on Long-Range Reconnaissance Patrols (LRRP) to collect information for 1ATF and were sometimes additionally tasked to conduct ambushes of communist forces. After a build-up period, the first New Zealand commanded patrol commenced on 7 January 1969. Each tour of duty in South Vietnam was for 12 months. At the end of each year, the Troop was replaced by another Troop from 1 Ranger Squadron, NZSAS. The first Troop was commanded by Captain Terry Culley; this Troop was replaced in full in late 1969 by a Troop commanded by Captain Graye Shattky. Members of this first replacement Troop took part in an operational Squadron parachute insertion on 15–16 December 1969. The final rotation occurred in late 1970, when the Troop was again replaced by a new body of men commanded by Second Lieutenant Jack Hayes. 4 Troop was withdrawn from South Vietnam on 20 February 1971, as a part of the New Zealand Government's withdrawal policy. On 14 January 1970 Sergeant G.J. Campbell was killed in action, being the first and only fatal NZSAS casualty during the unit's time in Vietnam with otherwise four wounded. The NZSAS did a total of 155 patrols in their 26 months of service in Vietnam and it was a NZ patrol that made the last contact with enemy forces before Australian and New Zealand SAS operations ceased, killing two Viet Cong soldiers north-west of Thua Tich on 4 February 1971. From November 1997 to 15 February 1998 a 19-man Troop sized detachment of NZSAS personnel were deployed as part of Operation BELISI, a peacekeeping operation in Bougainville. The Troop was tasked with providing security, medium-to-long range communications and medical support. While the troopers were unarmed except for pepper spray, they were involved in a number of heated situations which required careful negotiation to defuse. The troopers also conducted 'hearts-and-minds' patrols, staying in local villages and developing relationships with leaders. In addition, the NZSAS were involved in providing security and close protection to the various groups involved in peace negotiations that were held in New Zealand during 1998, including escorting the delegates from their home locations in Papua New Guinea, Bougainville and the Solomon Islands to New Zealand. Twenty-four NZSAS personnel were deployed to Kuwait in February 1998 on Operation GRIFFIN during a period of international tension with Iraq, tasked with rescuing downed airmen in hostile territory in the event of a US-led aerial campaign. A smaller force replaced them in May 1998 for a further two-month tour. There were no missions into Iraq undertaken during the deployment, though it was considered a useful opportunity to practice mobile desert warfare skills, and to have contact with US Forces which had been limited since the United States suspended its ANZUS relations with New Zealand in 1986. Once the NZSAS contingent was withdrawn, a New Zealand Coalition force liaison officer was maintained, with the position being commonly held by an NZSAS officer. On 12 March 2001, NZSAS Officer, Acting Major John McNutt was fulfilling this role when he was accidentally killed during a bombing demonstration. The position was withdrawn after this incident. In 1999 NZDF personnel were deployed to East Timor in response to a humanitarian and security crisis. The NZSAS deployed a Squadron sized contingent of 40 men under the command of (then) Major Peter Kelly, with two Troop Captains. On 9 September 1999, nine NZSAS personnel left New Zealand with an RNZAF C-130 aircraft, as the New Zealand Defence Force contribution to Operation DORIX, the evacuation of selected personnel from Dili, East Timor to Australia. Over 1500 personnel were evacuated during the operation under SASR and NZSAS protection. On 20 September 1999 a 'Response Force' consisting of 3 Squadron SASR, NZSAS troopers and elements of the United Kingdom Special Boat Service, departed Darwin by Royal Australian Air Force transport. They were tasked with securing the airport, a seaport and a heli-port to enable regular forces to land and deploy. This was achieved without any shots being fired. The NZSAS patrols were then utilised to perform to a variety of tasks including direction-action, special reconnaissance and close protection missions. The NZSAS element departed East Timor for New Zealand on 14 December 1999. Following the deaths of two members of the New Zealand Battalion Group in late June and early August 2000, combat tracking support was requested from the NZSAS. In August 2000, a Troop of about 12 NZSAS combat trackers were deployed with the task of locating militia who were crossing the border into East Timor. The Troops' efforts led to the successful placing of a number of ambushes, resulting in the deaths of three militia. In addition to performing combat tracking, on 6 September 2000, this Troop was utilised to conduct a permissive cross-border helicopter extraction operation of United Nations staff based at Atambua, West Timor. The Troop departed East Timor for New Zealand in January 2001. On 11 December 2001, as a part of New Zealand's contribution to Operation Enduring Freedom, the NZSAS commenced Operation CONCORD. This deployment saw the NZSAS deploying a Squadron as a component of Task Force K-Bar to perform operations as part of the War on Terrorism in Afghanistan. [nb 1] The Squadron performed a variety of missions including special reconnaissance, direct action, close personal protection and sensitive site exploitation. Initially special reconnaissance patrols were performed on foot with insertion and extraction being conducted by helicopter in the high-altitude snow-covered areas of southern and central Afghanistan. Three NZSAS patrols were involved in this manner during Operation Anaconda in March 2002. In May 2002 the focus changed to mounted operations with patrols using modified American Humvees, supported by motorbikes to conduct 'long-range extended-duration patrols'. These patrols would often last 20 to 30 days and cover between 1000 and 2000 kilometres. Three six-month 'roulements' of between 40 and 65 soldiers from the NZSAS served in Afghanistan during this time, before the unit returned to New Zealand on 12 December 2002. The NZSAS returned to Afghanistan in February 2004 on Operation CONCORD II in the lead up to the Afghanistan Presidential elections. Operations occurred in a number of provinces, utilising the same style of operations as the previous deployment. On 17 June 2004, two NZSAS soldiers were wounded in a pre-dawn gun-battle in central Afghanistan. In recognition of his actions during this engagement, SAS trooper Willie Apiata was awarded the Victoria Cross for New Zealand. The Squadron returned home in September 2004. In 2005, with Afghan Parliamentary elections looming, Operation CONCORD III was conducted. The Squadron sized deployment was to utilise the NZSAS's newly delivered Pinzgauer Special Operations Vehicles. The deployment was originally scheduled to commence in March 2005; however, due to problems with the new vehicles, this deployment date slipped to June 2005. Again, the squadron performed long-range patrols as well as direct-action operations, before being withdrawn in November 2005. Over the three CONCORD deployments to Afghanistan there were "casualties on both sides" during gun battles, with injuries also sustained as a result of vehicle crashes and striking mines or other unexploded ordnance but no New Zealanders were killed. 82 NZSAS and NZDF support personnel deployed to Afghanistan in September 2009, under Operation WĀTEA to form Task Force 81. This deployment was different from the unit's previous deployments to Afghanistan, as it was based in the capital city of Kabul, primarily to direct counter-insurgency operations in greater Kabul in cooperation with the Afghanistan Police's Crisis Response Unit (Task Force 24), which was operating under NZSAS mentorship. Originally the location of the deployment was not revealed publicly, however, its location was inadvertently revealed in the Norwegian press. Three rotations of troops were conducted to sustain the initial deployment, which was initially due to end in March 2011. However the mission was extended for a further year, although personnel numbers were reduced to 45. As part of the mentoring activities, NZSAS personnel were among the forces which responded to the January 2010 attack in central Kabul. Two personnel, one of them Corporal "Steve" David Steven Askin, were injured during the terrorist attack against the Inter-Continental hotel in Kabul on 29 June 2011, where members of the NZSAS also provided 'helo sniping' support. Askin and one other serviceman involved at the Inter-Continental were awarded the New Zealand Gallantry Star, the second-highest award after the Victoria Cross. Two members of the unit were killed during the deployment while mentoring operations. On 19 August 2011, Corporal Douglas Grant was killed when responding to an attack on the British Council building in the centre of Kabul, where the NZSAS was required to utilise specialist entry capabilities and Lance Corporal Leon Smith was killed on 28 September 2011 during an operation in Wardak Province. In January 2011, General David Petraeus announced that, since 2009, the NZSAS had made 60 "high-risk" arrests of suspected militants or Taliban leaders, seized 20 weapons caches, and foiled four attacks. He added that the unit had successfully executed more than 90% of its operations and raids without firing a shot. The unit was withdrawn from Afghanistan on 31 March 2012. On 21–22 August 2010, the NZSAS and members of the Afghan Crisis Response Unit participated in a military operation in Afghanistan's Tirgiran Valley known as Operation Burnham as part of the International Security Assistance Force. In March 2017, investigative journalists Nicky Hager and Jon Stephenson published a book on Operation Burnham Hit & Run: The New Zealand SAS in Afghanistan and the meaning of honour which alleged that NZSAS personnel had committed war crimes. The authors alleged that NZSAS personnel had attacked the Afghan villages of Naik and Khak Khuday Dad after Lieutenant Tim O'Donnell, 2/1 RNZIR part of the NZPRT, was killed by a roadside bomb. The allegations of war crimes in Hit & Run generated considerable public and media interest in New Zealand, which generated calls for an independent inquiry. Despite initial denying that the raids had occurred in the two villages, the NZDF subsequently acknowledged that NZSAS forces had been present in one of those villages but asserted that claims of civilian casualties were "unfounded." On 11 April 2018, the Labour-led coalition government announced that the Government would be holding an inquiry into Operation Burnham and the allegations in Hit & Run. Regular exchanges of personnel with foreign special forces units are conducted in order to build and maintain skills. This primarily occurs with 22 Special Air Service and the Special Air Service Regiment, but has also included units from Germany, Thailand, Brunei and Malaysia, with NZSAS personnel often providing combat tracking training in return. In addition "a number" of individual NZSAS personnel have successfully served alongside other New Zealand soldiers on peacekeeping operations and in peace-monitoring roles, including the New Zealand Contingent attached to the Multinational Force and Observers in Sinai. The New Zealand Military Attaché in Kuala Lumpur was alerted to the Malaysian Police Field Force's intention to raise a special forces unit. The NZSAS deployed a small training team, who were based at Ipoh and Sungai Pateni to assist with training the new unit. By rotating officers and non-commissioned officers, the NZSAS were able to sustain Operation RETURN ANGEL, for some two years until it reached a successful conclusion and the units were operational. Seven individual NZSAS personnel deployed to Southern Rhodesia as part of the "New Zealand Army Truce Monitoring Contingent Rhodesia 1979–80" on Operation MIDFORD. The contingent also included a number of ex-NZSAS personnel and served in Rhodesia from 7 December 1979 to 10 March 1980. Initially a number of individual NZSAS personnel deployed as part of the infantry company that New Zealand contributed to the United Nations peacekeeping operation in Bosnia during the break-up of Yugoslavia. From the third rotation of this infantry company, a group of four NZSAS personnel deployed in a Close Personal Protection capacity, with three rotations occurring over approximately eighteen months. On 17 July an earthquake occurred off the northern coast of Papua New Guinea. The shock occurred on a reverse fault and led to a tsunami that caused significant destruction and a high number of deaths. In response to an international request for assistance, New Zealand dispatched a Royal New Zealand Air Force C-130 aircraft loaded with relief supplies and six NZSAS advanced medics. The short notice deployment of the medics helped preserve lives that otherwise might have been lost. By June 2000, after several years of tension, the situation in the Solomon Islands had become unstable, resulting in the NZSAS being tasked with developing an evacuation plan for the New Zealand High Commission and its staff, as well as other New Zealanders in the Solomon Islands. A small NZSAS Troop was deployed on HMNZS Te Kaha, one of two Royal New Zealand Navy vessels that were stationed off the island. The Troop performed reconnaissance activities, however the situation calmed and the Troop was returned to New Zealand in July 2000. In 1964, NZSAS troopers were utilised to instruct early New Zealand Police Armed Offenders Squad members in field craft and weapon handling. This training relationship continued with the establishment of the Police Anti-Terrorist Squad (now known as the Special Tactics Group) and also included joint exercises. On 25 January 1968, David Maxwell Heron entered a farm house, murdered his brother-in-law and assaulted his brother-in-law's wife with a heavy object, before tying her up and fleeing. Five days after the incident armed NZSAS troopers joined the search for the suspect in a large area of swamp near Meremere, however Heron surrendered without incident the next day. During the Mount Eden Prison riots which occurred on 20–21 July 1965, the "battle trained" NZSAS troopers armed with automatic rifles with fixed bayonets, who "were prepared to shoot if necessary", were called to support police on the prison perimeter. The rioting prisoners eventually surrendered. Following the arrest of two of the French agents involved in the sinking of the ship Rainbow Warrior on 10 July 1985, the NZSAS were requested to support the New Zealand Police at an emergency holding prison established in Ardmore. The prison was used to hold Dominique Prieur, one of the arrested agents, due to concerns that French authorities might launch a rescue operation. The two NZSAS Sabre Squadrons are combat units capable of conducting a wide range of Special Operations tasks. Each squadron is divided into four troops. The four troops specialise in four different areas: Amphibious, Air, Mobility and Mountain operations. After completing the full NZSAS Regiment selection course, NZSAS candidates go on to undertake an intensive training cycle to build core skills. Those who complete the training cycle are accepted into the NZSAS and wear the sand beret with NZSAS badge and blue NZSAS stable belt. NZSAS operators then conduct further training to learn advanced special operations skills. The Commando Squadron (formerly Counter Terrorist Tactical Assault Group until 5 December 2009) was formed in 2005 in a bid to provide a dedicated counter terrorist capability within 1 NZSAS and the New Zealand Defence Force. The squadron consists of an undisclosed number of Counter Terrorist operators. Members of the Commando Squadron wear the sand beret with the Commando badge and stable belt. The Commando Squadron has the role of responding to domestic terrorist and special recovery incidents in New Zealand. The Commando Squadron are based full-time alongside the badged squadrons at the Papakura Military Camp in Auckland and are under the command of the Commanding Officer, 1 NZSAS. The Commando Squadron uses the Battle Training Facility at the Ardmore Military Camp to conduct their Close Quarter Battle urban, dynamic entry and room clearing drills as well as their marksman skills. The 1st New Zealand Explosive Ordnance Disposal (EOD) Squadron is a specialist task unit within the NZSAS Regiment. It was established in August 2005 as an independent Force Troops Squadron, before coming under Operational Command of 1 NZSAS Regiment in July 2009. It provides support to the New Zealand police to "render safe" chemical, biological, radiological, nuclear and improvised explosive devices, commercial explosives and military munitions, domestically as well as overseas where New Zealand troops are operating. Personnel who serve in the squadron wear the sand beret with the EOD Squadron badge and stable belt. The Squadron badge includes the motto "Into Harm's Way". The Squadron is based at Trentham Military Camp, with Troops located in Auckland, Wellington and Christchurch. The Support Squadron is responsible for meeting the support needs of the NZSAS Regiment and includes logistics, intelligence, medical, administration and communications personnel. Personnel are given specific trade training upon joining the Regiment as well as having the opportunity to complete other specialist courses such as parachuting. Qualified Support Squadron personnel wear the sand beret with their corps badge. To join the NZSAS Regiment, New Zealand Army, Navy, or Air Force personnel must pass a selection course, with the course varying depending on the role they seek within the Regiment. In 2011 the selection course was also opened to civilians; they spend two days preparing for the selection course learning military skills considered necessary to compete safely against military applicants. In 2007, a four part documentary NZSAS: First Among Equals was produced on the selection course and training. The SAS selection standard remains the same, with the full course aiming to identify "self-disciplined individuals who are capable of working effectively as part of a small group under stressful conditions for long periods of time". However, the earlier phases of the selection course have been opened up to candidates who wish to join the Regiment as a Commando. This is described as advancing through a series of 'gates'. Gate 1: After four days the first gate is reached which allows a candidate to be considered for a role as a Commando. This phase involves completing "1 NZSAS Regt fitness testing and mixed terrain navigation". Gate 2: Gate 2 is reached after nine days and is the conclusion of the selection course. This phase involves completing "close country navigation and other activities" and those who get to this point are considered for SAS training. Those who are selected go on to complete an intensive period of training to build core special forces skills. On average 10–15% of candidates pass both selection and cycle training. Commando and SAS commissioned Officer candidates also undergo an additional two days of selection to test their suitability to solve problems when tired and under pressure. All support and EOD personnel who wish to join the NZSAS Regiment must complete a ten-day 'Special Operations Forces Induction Course'. This involves completing a revised version of the first two days of NZSAS Selection. Given the nature of their roles, support and EOD candidates are given more time to complete the activities than NZSAS and Commando candidates and are provided with normal sleep and food intake. The course also "provides familiarisation with specialist weapons and equipment, and educates personnel on the ethos and values of the Unit". In 2016, it was announced that the 13 Pinzgauer Special Operations (MV-SO) Vehicles acquired in 2005 would be replaced by Supacat HMT Extenda vehicles designated as the Special Operations Vehicles – Mobility Heavy (SOV-MH). An undisclosed number will be ordered that are reconfigurable with four configurations under a $28 million contract with deliveries from late 2017. Military Cross: Lieutenant Ian Hamilton Burrows, Major Frank Rennie. Mention in Dispatches: Lieutenant Earle Watson Yandall, Major Frank Rennie, Captain Graham Neil McLaren Boswell, Lieutenant John Airth Mace. British Empire Medal: Trooper Stephen Colin Watene. Negri Sembilan Conspicuous Gallantry Medal: Lieutenant Ian Hamilton Burrows, Lieutenant Earle Watson Yandall. Negri Sembilan Distinguished Conduct Medal: Trooper Grey Otene, Lance Corporal Robert Percy Withers, Lance Corporal Raymond Stennett Hurle. Military Cross: Lieutenant Eru Ihaka Manuera. Mention in Dispatches: Corporal Niwa Kawha, Temporary Sergeant Kenneth Michael Schimanski. It was announced on 2 July 2007 that Corporal Willie Apiata of the NZSAS had been awarded the Victoria Cross for New Zealand for carrying a severely injured comrade 70 metres "under heavy fire" from machine-guns, Rocket Propelled Grenades (RPGs) and grenades after their vehicle was destroyed in an ambush and then joined the rest of his comrades in a counter-attack. When announced, some names of personnel were withheld for security reasons. New Zealand Gallantry Decoration: Captain Craig Wilson (listed as Captain 'C' when announced), Corporal 'B', Lance Corporal Leon Kristopher Smith. New Zealand Gallantry Medal: Corporal 'R'. In July 2012, Smith was also posthumously awarded the Charles Upham Bravery Award, performing in the opinion of the Upham trust, the most outstanding act of heroism during the two previous years. Silver Star: unnamed 'non-badged' medic. Defense Meritorious Service Medal: Lieutenant Colonel Christopher John Parsons. At a ceremony held at the Marine Corps Air Station, Miramar, California on 7 December 2004, the United States Navy Presidential Unit Citation was awarded to the NZSAS and the other units that comprised the Combined Joint Special Operations Task Force-SOUTH/Task Force K-BAR between 17 October 2001 and 30 March 2002. It was awarded for "extraordinary heroism and outstanding performance of duty in action" and noted that those awarded established "benchmark standard of professionalism, tenacity, courage, tactical brilliance, and operational brilliance, and operational excellence while demonstrating superb esprit de corps and maintaining the highest measures of combat readiness." Officer of the New Zealand Order of Merit: Acting Lieutenant Colonel James William Blackwell, Acting Lieutenant Colonel R.M. (2005), Acting Lieutenant Colonel R.G. (2006). Member of the Order of the British Empire: Captain Lenard Donald Grant, Major Neville Sutcliffe Kidd, Captain Paul Tekatene Andrew, Major Derek Graye Shattky, Acting Warrant Officer Class One Kevin R. Herewini, Captain Kenneth Edward McKee Wright, Warrant Officer Class One Busby Otene, Captain William John Lillicrapp. Member of the New Zealand Order of Merit: Corporal David Alexander Ryan, Captain Christopher John Parsons, Corporal J. 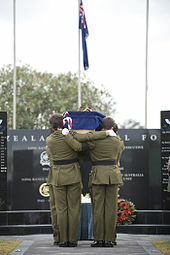 (2000), Major Peter Te Aroha Emile Kelly, Sergeant T. (2002), Staff Sergeant Adrian Garry Vogt, Staff Sergeant G. (2003), Major R. (2006), Staff Sergeant Troy Elliott Perano. British Empire Medal: Sergeant Eric Ball, Lance Corporal Niwa Kawha, Staff Sergeant Henry Keith Handley, Sergeant Peihopa Brown, Temporary Warrant Officer Class Two Daniel Wilfred Wilson, Temporary Staff Sergeant Frederic Donald Barclay, Sergeant Joseph Johnston, Sergeant Maurice Edwards, Sergeant Michael Anthony Cunningham, Warrant Officer Class Two Whi[nb 3] Wanoa, Staff Sergeant Benjamin Ngapo, Staff Sergeant Victor Kawana Timu, Lance Corporal Earle Alexander John Henry, Sergeant John Howard Joseph Ward, Staff Sergeant Sotia Ponijasi, Staff Sergeant Patrick Anthony Tracey. New Zealand Distinguished Service Decoration: Lieutenant Colonel Christopher John Parsons, Major Brent John Quin. Barrie "Baz" Rice – star of Treasure Island: Extreme. Jerry Mateparae the 20th Governor-General of New Zealand, who joined the Army as a Private and ended his service as a Lieutenant General and Chief of Defence Force, New Zealand's senior uniformed military appointment. Martyn Dunne – Former NZSAS Squadron Commander, who went on to later become a General in the New Zealand Army. Mike Coburn (pseudonym) – later joined 22 SAS, was a member of the much publicised Bravo Two Zero patrol and authored the book Soldier Five about his experiences. Willie Apiata VC – first (and currently the only) recipient of the Victoria Cross for New Zealand. Wilson Whineray – Honorary Colonel Commandant from 1997 to 2001. Steve Askin – Former NZSAS soldier who was killed in a helicopter crash fighting the 2017 Port Hills fires. This is the same inscription as on the British Special Air Service's memorial. ^ Although reported in some sources, the New Zealand SAS was not attached to the Australian SASR during this period, as each unit operated in different areas. While the Australians operated autonomously around Kandahar, the New Zealand SAS relied on logistic and command support provided by American units in Bagram. ^ As the NZSAS official history withheld names of some personnel, unless they are otherwise publicly identified as being associated with the NZSAS, they have also been redacted in this list. ^ "Army Today:NZSAS" (PDF). NZDF. 2013. Retrieved 8 July 2013. ^ New Zealand Defence Force. "The 2013–2014 Output Plan" (PDF). New Zealand Government. p. S3 – 34. Retrieved 4 January 2017. ^ Thomas & Lord 1995, p. 85, Part 1. ^ Crosby 2009, p. 51. ^ a b Crosby 2009, p. 58. ^ a b c Crosby 2009, p. 118. ^ Crosby 2009, p. 122. ^ RSM 1NZSAS Group. "NZSAS Operational History". Fight Times. Retrieved 7 July 2013. ^ a b Thomas & Lord 1995, pp. 104–105, Part 2. ^ Crosby 2009, pp. 124–125. ^ Crosby 2009, p. 290. ^ Crosby 2009, p. 291. ^ Crosby 2009, p. 377. ^ "New Battle Training Facility for NZDF". New Zealand Defence Force (Press release). 8 April 2016. Retrieved 16 August 2016. ^ Roberts, Mike (8 April 2016). "SAS opens $46M training facility". Newshub. Retrieved 16 August 2016. ^ Schouten, Hank (20 December 2012). "New site for SAS to train for battle". Stuff.co.nz. Retrieved 12 May 2013. ^ Pugsley 2003, p. 88. ^ a b c Lord & Tennant 2000, pp. 110–112. ^ Crosby 2009, p. 135. ^ Crosby 2009, p. 275. ^ a b c d e "1st New Zealand Special Air Service Regiment" (PDF). New Zealand Army News. February 2013. p. 9. Retrieved 27 February 2013. ^ Thomas & Lord 1995, p. 95, Part 1. ^ "1 NZSAS Group Embellishments" (PDF). NZ Army News (404). 17 November 2009. p. 7. Retrieved 6 May 2014. ^ Crosby 2009, pp. 276–277. ^ Taylor, Richard (1996). Tribe of the War God: Ngati Tumatauenga. Heritage. p. 90. ISBN 9780908887187. ^ Rennie, Frank (1986). Regular Soldier: A Life in the New Zealand Army. Endeavour Press. p. 225. ISBN 0-86481-170-5. ^ Pugsley 2003, p. 89. ^ Pugsley 2003, p. 98. ^ Pugsley 2003, p. 113. ^ Pugsley 2003, p. 121. ^ Pugsley 2003, p. 104. ^ Crosby 2009, p. 205. ^ Crosby 2009, p. 129. ^ Crosby 2009, pp. 131–133. ^ Crosby 2009, p. 134. ^ Crosby 2009, p. 136. ^ a b Crosby 2009, p. 138. ^ Crosby 2009, p. 142. ^ Crosby 2009, p. 139. ^ Crosby 2009, p. 144. ^ Crosby 2009, p. 145. ^ Crosby 2009, p. 152. ^ Crosby 2009, pp. 152–153. ^ a b Crosby 2009, p. 155. ^ Crosby 2009, p. 164. ^ Crosby 2009, p. 166. ^ a b Crosby 2009, p. 167. ^ Crosby 2009, p. 168. ^ Crosby 2009, p. 170. ^ a b Crosby 2009, p. 183. ^ Crosby 2009, p. 180. ^ a b Crosby 2009, p. 206. ^ Crosby 2009, p. 195. ^ Crosby 2009, p. 218. ^ Crosby 2009, p. 234. ^ Crosby 2009, p. 239. ^ Crosby 2009, p. 447. ^ Rottman, Gordon. Vietnam Airborne. Osprey Publishing. pp. 50–51. ISBN 0-85045-941-9. ^ "Nicky Hager " Phantom Soldiers". nickyhager.info. ^ "1st Squadron, Special Air Service Regiment". Vietnam War, 1962–1972 units. Australian War Memorial. Retrieved 3 May 2014. ^ a b Crosby 2009, p. 298. ^ Crosby 2009, pp. 298–299. ^ Crosby 2009, p. 300. ^ Crosby 2009, p. 302. ^ Crosby 2009, p. 304. ^ Crosby 2009, p. 306. ^ Crosby 2009, p. 409. ^ Crosby 2009, p. 324. ^ Crosby 2009, pp. 324–325. ^ Crosby 2009, p. 326. ^ a b Crosby 2009, p. 337. ^ Crosby 2009, p. 328. ^ Crosby 2009, p. 333. ^ a b Crosby 2009, p. 343. ^ Crosby 2009, pp. 338–339. ^ Crosby 2009, p. 351. ^ Micheletti, Eric (2003). Special Forces: War on Terrorism in Afghanistan 2001–2003. Paris: Histoire & Collections. p. 143. ISBN 2-913903-90-8. ^ Crosby 2009, p. 357. ^ Crosby 2009, p. 354. ^ Crosby 2009, p. 355. ^ Crosby 2009, p. 368. ^ Crosby 2009, p. 376. ^ Crosby 2009, p. 380. ^ Crosby 2009, pp. 382–383. ^ a b c d e "Special Honours List 2 July 2007 (Gallantry Awards)". DPMC. 2 July 2007. Retrieved 1 June 2013. ^ a b Crosby 2009, p. 385. ^ a b Crosby 2009, p. 388. ^ Crosby 2009, p. 389. ^ Crosby 2009, pp. 391–392. ^ Crosby 2009, p. 390. ^ "SAS back in NZ, no plans to return". New Zealand Herald. 22 November 2005. Retrieved 2008-05-03. ^ Crosby 2009, p. 375. ^ a b c "Fact Sheet: New Zealand Special Air Service NZSAS". New Zealand Government. 2 July 2007. Retrieved 2013-05-12. ^ "Annual Report 2010" (PDF). New Zealand Defence Force. 2010. p. 109. Retrieved 7 July 2013. ^ "1 NZSAS Regt Selection Course" (PDF). New Zealand Army News. April 2012. p. 2. Retrieved 17 June 2013. ^ Stephenson, Jon; Hubbard, Anthony (24 January 2010). "Key 'broke pledge' on Kiwis in battle". Stuff. Retrieved 7 July 2013. ^ Stephenson, Jon (4 October 2009). "SAS Afghan location revealed". The Sunday Star-Times. Retrieved 30 October 2011. ^ "Annual Report 2011" (PDF). New Zealand Defence Force. 2011. p. 117. Retrieved 7 July 2013. ^ a b Young, Audrey (30 June 2011). "SAS men wounded in Kabul raid". New Zealand Herald. Retrieved 7 July 2013. ^ "NZ troops uninjured in Kabul attack – Key". The New Zealand Herald. 19 January 2010. Retrieved 19 January 2010. ^ a b "Helicopter pilot was decorated soldier" (Press release). New Zealand Defence Force. Scoop. 15 February 2017. Retrieved 15 February 2017. ^ a b "Afghan Crisis Response Unit, Search and Arrest Operation (mentored by the NZSAS) Wardak Province, Afghanistan" (PDF). NZDF. September 2011. Retrieved 8 July 2013. ^ Brownlee, Gerry (9 December 2014). "Gallantry Awards recognise NZSAS". New Zealand Government. Retrieved 15 February 2017. ^ Vernon Small, Tracy Watkins and Danya Levy (29 September 2011). "Key: no honour for soldiers by withdrawing". Stuff.co.nz. Retrieved 30 October 2011. ^ a b Hume, Tim (16 January 2011). "Top Medal From US For Kiwi SAS Commander". The Sunday Star-Times. Retrieved 8 July 2013. ^ "Job well done NZSAS" (Press release). New Zealand Defence Force. Retrieved 16 June 2013. ^ Parker, David. "Approval for Inquiry into Operation Burnham". Scoop. New Zealand Government. Retrieved 11 April 2018. ^ "Operation Burnham information pack" (PDF). New Zealand Defence Force. Retrieved 11 April 2018. ^ Hager and Stephenson 2017, p. backcover,14-136. ^ "New Hager book is Hit & Run: The New Zealand SAS in Afghanistan and the Meaning of Honour". The Spinoff. 21 March 2017. Retrieved 15 November 2017. ^ Edwards, Bryce (22 March 2017). "Political Roundup: The hardest hitting responses to Nicky Hager's book 'Hit and run". New Zealand Herald. Retrieved 15 November 2017. ^ Broughton, Cate (13 March 2018). "Defence Force admits book location right, but denies civilian casualties". Stuff.co.nz. Retrieved 22 March 2018. ^ Jones, Nicholas (13 March 2018). "Hit & Run raid: Defence Force acknowledges 'confusion' on civilian casualty statements". New Zealand Herald. Retrieved 22 March 2018. ^ "Government to hold inquiry on Operation Burnham after allegations in book Hit & Run". 1 News. 11 April 2018. Retrieved 11 April 2018. ^ Brigadier J. A. Dennistoun-Wood (19 February 1998). "Letter to editor: SAS MYTH". New Zealand Herald. ^ Crosby 2009, pp. 295–296. ^ Crosby 2009, pp. 259–260. ^ Crosby 2009, pp. 263–266. ^ Crosby 2009, pp. 291–292. ^ Crosby 2009, pp. 308–309. ^ Crosby 2009, p. 336. ^ Van Beynen 1998, p. 209. ^ Van Beynen 1998, p. 211. ^ Cherrett 1989, p. 132. ^ Cherrett 1989, p. 317. ^ Crosby 2009, pp. 274–275. ^ a b NZ Army News & a2009, p. 8. ^ "Counter Terrorist Assault Group to change name to Commandos" (PDF). New Zealand Army News. 17 November 2009. p. 2. Retrieved 1 June 2013. ^ Gower, Patrick (12 August 2006). "Shortage leaves B-team on guard". New Zealand Herald. Retrieved 2008-05-03. ^ Gower, Patrick (12 August 2006). "Debunking rumours about new anti-terrorism unit". New Zealand Herald. Retrieved 2008-05-03. ^ "EOD Team Member Selection" (PDF). New Zealand Army News. September 2011. p. 13. Retrieved 1 June 2013. ^ "The Right Cost, The Right Time, The Right Product" (PDF). New Zealand Army News. 10 March 2009. p. 7. Retrieved 1 June 2013. ^ Brown, Major Nick (February 2015). "Fancy a career in bomb disposal? The new explosive ordnance disposal operator trade" (PDF). Navy Today – official magazine of the Royal New Zealand Navy. No. 186. p. 23. Retrieved 4 January 2017. ^ "Special Operations Communicator" (PDF). New Zealand Army News. July 2012. p. 11. Retrieved 1 June 2013. ^ a b c "1 NZSAS Regt Selection Course" (PDF). New Zealand Army News. April 2012. p. 17. Retrieved 17 June 2013. ^ a b c d "1 NZ SAS Gp Selection" (PDF). New Zealand Army News. May 2011. p. 12. Retrieved 1 June 2013. ^ Mike Roberts; Steven O'Meagher (2007). NZSAS: First Among Equals, inside the New Zealand Special Air Service (Documentary). Desert Road Television. ^ Crosby 2009, p. 430. ^ "The Right Calibre of Personnel...Supporting 1 NZSAS Gp" (PDF). New Zealand Army News. June 2011. p. 21. Retrieved 17 June 2013. ^ "Pinzgauer Light Operational Vehicles". New Zealand Defence Force. October 2004. Archived from the original on 12 November 2004. ^ a b "Supacat to deliver Special Operations Vehicles – Mobility Heavy (SOV-MH) to New Zealand". Supacat (Press release). 5 September 2016. Retrieved 16 September 2016. ^ a b Defence Minister Gerry Brownlee (6 September 2016). "New vehicles for NZ Special Forces". The official website of the New Zealand Government (Press release). Retrieved 16 September 2016. ^ "No. 41079". The London Gazette (Supplement). 28 May 1957. p. 3156. ^ "No. 41392". The London Gazette (Supplement). 23 May 1958. p. 3238. ^ "No. 41079". The London Gazette (Supplement). 28 May 1957. p. 3157. ^ "No. 41257". The London Gazette (Supplement). 20 December 1957. p. 7429. ^ a b "No. 41392". The London Gazette (Supplement). 23 May 1958. p. 3239. ^ "No. 41257". The London Gazette (Supplement). 20 December 1957. p. 7428. ^ a b c d e f g h i j k l Crosby 2009, p. 449. ^ "No. 43837". The London Gazette (Supplement). 14 December 1965. p. 11681. ^ "No. 43837". The London Gazette (Supplement). 14 December 1965. p. 11682. ^ "No. 44196". The London Gazette (Supplement). 13 December 1966. p. 13461. ^ "I was only doing my job, says VC hero". New Zealand Herald. 2 July 2007. Retrieved 8 December 2016. ^ "The New Zealand Gallantry Awards". DPMC. Retrieved 8 July 2013. ^ "Injured soldier fought beside Apiata". Stuff. 14 August 2012. Retrieved 1 June 2013. ^ "Special Honours List 20 April 2013 (Gallantry Awards)". DPMC. 20 April 2013. Retrieved 1 June 2013. ^ "Charles Upham Bravery Award". The Governor General. 3 July 2012. Retrieved 1 June 2013. ^ a b "Approval for the acceptance and wear of the United States Navy Presidential Citation by the NZ SAS in Afghanistan". New Zealand Defence Force. 19 May 2006. Retrieved 3 July 2007. ^ "The Queen's Birthday and Golden Jubilee Honours List 2002". DPMC. 3 June 2002. Retrieved 10 July 2013. ^ "No. 44328". The London Gazette (Supplement). 10 June 1967. p. 6312. ^ "No. 46595". The London Gazette (Supplement). 14 June 1975. p. 7409. ^ "No. 47551". The London Gazette (Supplement). 3 June 1978. p. 6272. ^ "No. 48043". The London Gazette (Supplement). 31 December 1979. p. 28. ^ "No. 49584". The London Gazette (Supplement). 31 December 1983. p. 36. ^ "No. 50362". The London Gazette (Supplement). 31 December 1985. p. 32. ^ "No. 50766". The London Gazette (Supplement). 31 December 1986. p. 36. ^ "No. 53154". The London Gazette (Supplement). 31 December 1992. p. 32. ^ "New Years Honours List 1998". DPMC. 31 December 1997. Retrieved 10 July 2013. ^ "The Queen's Birthday Honours List 2000 (including Special List for East Timor)". DPMC. 5 June 2000. Retrieved 9 July 2013. ^ "New Years Honours List 2001". DPMC. 30 December 2000. Retrieved 10 July 2013. ^ "New Years Honours List 2003". DPMC. 31 December 2003. Retrieved 10 July 2013. ^ "Queen's Birthday Honours List 2006". DPMC. 5 June 2006. Retrieved 10 July 2013. ^ "No. 44006". The London Gazette (Supplement). 11 June 1966. p. 6573. ^ "No. 43856". The London Gazette (Supplement). 1 January 1966. p. 43. ^ "No. 44486". The London Gazette (Supplement). 1 January 1968. p. 43. ^ "No. 45119". The London Gazette (Supplement). 31 December 1992. p. 5407. ^ "No. 4526". The London Gazette (Supplement). 1 January 1971. p. 41. ^ "No. 45386". The London Gazette (Supplement). 12 June 1971. p. 5999. ^ "No. 45680". The London Gazette (Supplement). 3 June 1972. p. 629. ^ "No. 45985". The London Gazette (Supplement). 2 June 1973. p. 6509. ^ "No. 47551". The London Gazette (Supplement). 3 June 1978. p. 6273. ^ "No. 48043". The London Gazette (Supplement). 31 December 1979. p. 29. ^ "No. 48839". The London Gazette (Supplement). 31 December 1981. p. 43. ^ "No. 49584". The London Gazette (Supplement). 31 December 1983. p. 37. ^ "No. 49769". The London Gazette (Supplement). 16 June 1984. p. B33. ^ "No. 49970". The London Gazette (Supplement). 31 December 1984. p. B33. ^ "No. 50553". The London Gazette (Supplement). 14 June 1986. p. B35. ^ "No. 51367". The London Gazette (Supplement). 11 June 1988. p. B37. ^ "Queen's Birthday Honours List 2011". DPMC. 6 June 2011. Retrieved 10 July 2013. ^ "Queen's Birthday Honours List 2013". DPMC. 3 June 2013. Retrieved 12 July 2013. ^ "The Bugle" (PDF). NZDF. June 2013. p. 16. Retrieved 12 July 2013. ^ "Record of Service: Shocker Shaw". Fight Times Magazine. ^ "Dying for a fortune". Sunday News. 15 September 2007. Archived from the original on 28 March 2009. Retrieved 2009-03-28. "The Selected Few – Training in the SAS" (PDF). NZ Army News (402). 15 September 2009. ISSN 1170-4411. Retrieved 22 January 2017. Cherrett, Owen (1989). Without Fear or Favour: 150 Years Police Auckland 1840–1990. The New Zealand Police and L. Patrick Hunter. ISBN 0-473-00784-3. Crosby, Ron (2009). NZSAS: The First Fifty Years. Viking. ISBN 978-0-67-007424-2. Lord, Cliff; Tennant, Julian (2000). ANZAC Elite. IPL Books. ISBN 0-908876-10-6. Pugsley, Christopher (2003). From Emergency to Confrontation: The New Zealand Armed Forces in Malaya and Borneo 1949–1966. Oxford University Press. ISBN 0-19-558453-8. Hager, Nicky; Stephenson, Jon (2017). Hit & Run: The New Zealand SAS in Afghanistan and the meaning of honour. Nelson, New Zealand: Potton & Burton. ISBN 9780947503390. Thomas, Malcolm; Lord, Cliff (1995). New Zealand Army Distinguishing Patches 1911–1991. Malcolm Thomas and Cliff Lord. ISBN 0-473-03290-2. Van Beynen, Ray (1998). Zero-Alpha: The NZ Police Armed Offenders Squad official history. North Harbour, Auckland: Howling at the Moon Productions. ISBN 0-9583717-4-1. Baker, William Darrell; St-Jean, Mike (1987). Dare to Win: The Story of the New Zealand Special Air Service. Melbourne, Australia: Lothian Publishing, Auckland, N.Z. ISBN 0850912776. Ball, Rhys (2009). The Platforms: an examination of New Zealand Special Air Service Campaigns from Borneo 'Confrontation' to the Vietnam War, 1965–1971 (PDF) (PhD thesis). New Zealand: Massey University.